If you’ve looked at majors, and you’ve researched the faculty in that department, understood the cohorts, how you plug into their school, examined the value of capstone schools, asked about real class sizes and kicked the tires of schools and the towns that they’re in during your visits, then you should have a pretty good idea about the schools where you could see yourself going. 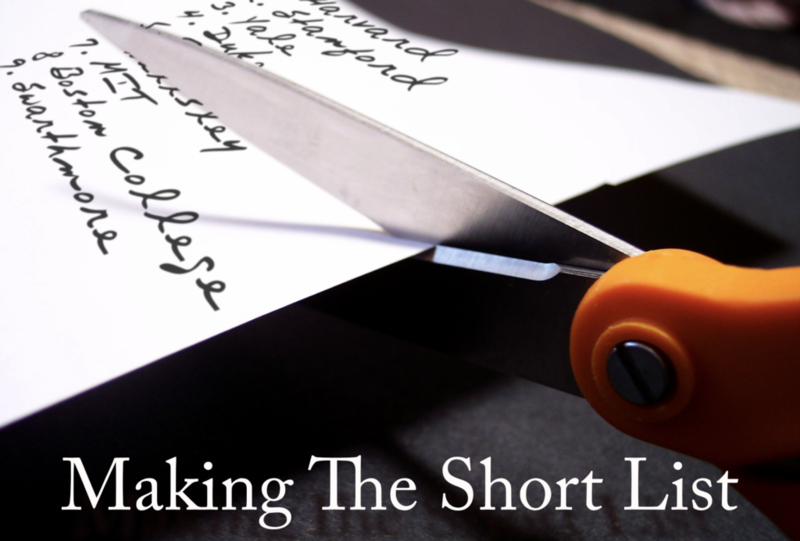 Take your long list, and let’s look at narrowing your choices. If you’re not applying to an art school or conservatory, you can skip the section on how to apply to one. If you’re applying to a school in your art, which requires an audition or a portfolio review that requires you to be physically present, you will need to limit the number of schools to a max, really, of seven (7). You probably will not get into 100% of your school choices, but, if you do, you need to be prepared to go to all of them and audition, because you still won’t know, until the letters come out, which ones you were admitted to and they’re ALL highly competitive. Take a look at all of the performance requirements, and copy them into a text file from each website, so you can review them and share them with your artist in residence, or arts instructor. Ask the people who give you lessons how to best structure your application process. Be especially careful if you are applying to Juilliard. They squirrel requirements around different pages of their website, and, if you miss any of them, you can make your application useless. If you’re thinking about a performance school or conservatory like Juilliard, you should, as a junior, have already been taking a lesson to get to the top of the list prior to audition. Is it impossible to bypass that method of entry? No. Highly unlikely? Yes. If you haven’t done it, don’t remove the school, but you can put it a lot lower on your list. If you’re applying to a place with extensive portfolio review of your work, like CalArts or Art Center, they want to see your portfolios a year before you apply, to help you structure them to give you a good shot of getting in. Take them up on the offer. Likewise a summer program at SAIC in Chicago, or one of the portfolio reviews for RISD can help you assess what you need, and to how many places it will be appropriate to make application. If you don’t have an audition requirement, or you can digitally apply with your portfolio, you can apply to schools using the same track as everyone else. After your junior year, the summer, with the AP scores, SAT and/or ACT, SAT subject tests, and Dual Enrollment that you have RIGHT NOW, where do you stand? Are your grades where they need to be for the schools to which you applied? Are your test scores within the range most students who are accepted to your top choices have? Taking more standardized tests? Missed the SAT subject tests? You can do that, and continue to narrow and apply. If your SAT/ACT tests aren’t great, consider great test-optional schools! Some of the best colleges in the nation don’t believe in the SAT much either. They have to keep it around to keep the US News rankings up or they get cut from the magazine’s list. If you’re coming into the Fall without the pieces in place, it may move some schools further down your list, because of their requirements used to screen out students . Don’t remove them! Don’t ask. Don’t get. If you’ve had a major grade drop or increase over the last year, revisit the long list with your advisor. You may need to adjust before shortening. Research: Take out your long list. You’ve been visiting at least a few schools. You’ve researched the faculty in your major. You should know the curriculum at the schools that interest you pretty well by now. Your parents have talked to financial aid, and/or used one of the school cost calculators that some schools provide to figure out what the “estimated,” price-tag is, although it will be different, in reality, after you haggle with schools on acceptance. Sit down with your list, and the scattergrams from a service like Naviance. Who is getting in from your school to these places? You are judged against your school. Best to know how they perform with the schools on your list. Every high school is tracked by colleges. Your school may also track data on students. If you have the Naviance system at your school, you can look up the scattergrams of each school to which you are interested in applying. You can see past admits, wait lists and how many students applied from your school, and your school’s actual acceptance and even attendance rates. On the left of each graph (see below) is the GPA scale. You can flip between SAT & ACT to see the rankings there. 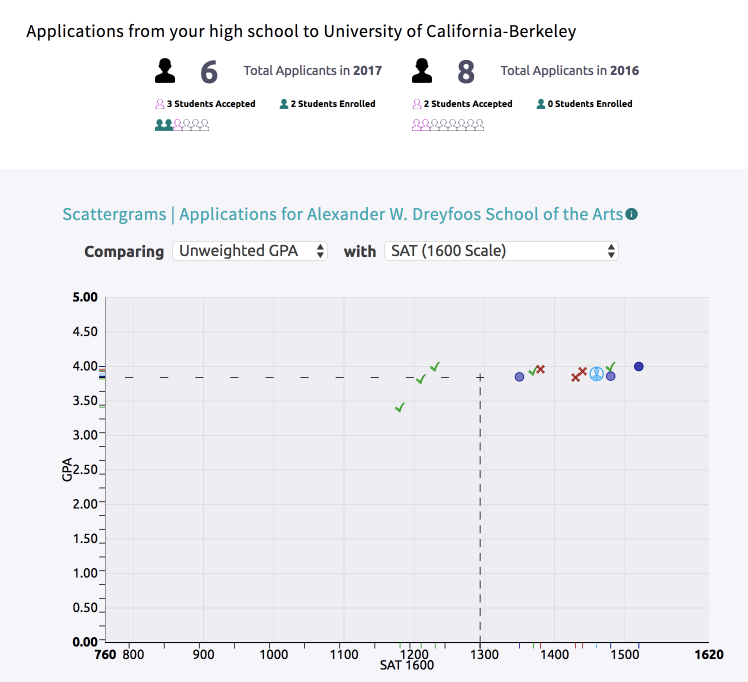 The admit rate for a university like University of California at Berkeley (See example, left), the admit rate for this school, from a small pool of applicants was 50% in 2017, and 25% in 2016. On the left is the GPA scale, and you can flip between SAT & ACT to see the rankings there. That’s helpful to know, because the general numbers that colleges put out for all schools may not apply to yours. Based on the scattergrams, move your choices around a bit, until you’ve come up with your stronger list of ten to twelve schools. It may not be your final choices, but we’re getting closer. IMPORTANT: Do not base decisions on solely on scattergrams. A classic problem for parents and/or students is trying to use these to convince themselves not to try for a school. Even in our example, students with LOWER SAT scores and lower GPAs were admitted (Green check) while students with higher test scores and GPAs were not. Due to cohorts, it is not always about the numbers! When you did your research, what did you find out? Who are the best professors for your major? Who gave you the best connectivity that you had with faculty at a school? Did you have a particularly positive experience with an interview, or an admissions officer at a college fair? Do you like the area around the school? Do you feel good there? What was the vibe of the students on campus? Did you visit a local coffee house or a restaurant? Talk to anyone in the town, or students on campus that don’t work for admissions? Research the costs of housing and food in the area. Some colleges, like Columbia, subsidize their dorms. Some, like Boston University set the newer ones to market rates, which can be very high. Are you required to live on campus for your freshman year? All four years? How much will the university pick up of on-campus housing if you get an academic scholarship? What is the price of housing in the area? Visit a market. What are the food costs in the area? Sales tax? Knowing your costs are part of the big picture of which schools may offer you more bang for your buck. Research the costs/best ways to travel. Look at the school’s holiday dates. They can vary a bit for good reasons. Plug in the cost of tickets at peak holidays like Thanksgiving and Christmas. Do they soar to out-of-range prices? If so, how do you get to school and back? Don’t remove a school for this, but DO ASK the admissions office and your advisor that you’re working with about how students work around it. Bates, in Lewiston Maine, gives an extra few days off on Thanksgiving to get students home outside of the piracy zone. You can also take a nice wi-fi equipped bus from there to bigger Boston-Logan airport, than pricier Portland, Maine. If you visit a school, make sure that you make enough time to drop by your future major’s department. Ask a lot of questions of passing faculty, and students in the department. That’s the only way to know, for sure, what you’re getting into. If you can’t travel, not the end of the world! Many colleges’ majors have facebook groups or pages. A few have their own websites. Talk to people there. Your high school has alumni at that school. Reach out, and ask them how about their experiences. The ease of applying digitally means that schools get a ton of applications. Why not? They make a lot of money off of them. Millions of dollars for the bigger and more popular schools. The problem, though, is, when a college screens thousands, or, for UCLA, more than 100,000, how do they know which students are more apt to come? Early Decision/Early Action is the best way to go if you KNOW that you need to be at a particular school. Some schools use EA, some use ED. Many have little “wrinkles” in their rules, so make sure you read all of the details at their website carefully. If you have any questions ask your guidance counselor and/or college advisor to help. EA & ED put you in a much smaller pool of applicants. If you are deferred, you get a second-round pass at the regular decision period, improving your opportunities. Early Decision is a really good idea, but, please remember that Early Decision is a binding commitment to going to that school. Check with financial aid about how that works at the school of your choice to make sure that this is the route to take for you. Early Action, where offered, gets you a yes early, without the commitment of early decision. Definitely worthwhile! Some of your schools may offer EA2/ED2, a second round of early decision. You apply early. If the first school does not take you, the second choice school gets a chance to grab you up. Again, Early Decision 2 is binding. When you have made those choices, and done your homework on the last round, finalize your list. Most people will apply to ten to twelve schools because of the high number of students applying nationally. You should apply to a MINIMUM of six if you are on a non-arts track, and four to six if you’re in performance or other heavy audition tracks. Your Early Action and/or Early Decision schools will be at the top. The next should be the schools that meet your needs that come closest. Put your final list into Naviance, or our system if you work with us. Give it to your guidance counselor, and to anyone helping you with your college process. Create a spreadsheet where you list, for each school, all of the deadlines, including department/college deadlines, for arts and/or some pre-med or engineering tracks at schools, filing requirements, whether the school is common app, coalition app, or something else. Notify your guidance counselor and your teachers writing letters of recommendation of your intent to apply early decision or early action when your list is finished, and well before the middle of September. Do not surprise them! Copy down the supplemental questions in a Google doc or Word file. Which ones are similar? Use our Supplementals guide for doing these well! Is there something in your main essay that should come out and be used in the short answer area, because it would be better there? DO NOT REPEAT anything from the main essay in your short answers. Get the applications done as early as possible. Have someone go over both your essay and short-answer for readability, clarity, and flow. Make sure you provide unique information, and stay to your word and/or character counts! Go to your teachers writing letters of recommendation with the complete list of your schools, your resumé, the deadlines for recommendations, and provide them with any forms or digital files that they may need to do the applications. Make sure you have given the guidance counselor everything that they need to help you, especially the resumé, and, if you feel comfortable, your essay. This would be a good time to tell them about anything else in your personal life that also may weigh in on your admissions. If you lost a close family member, lost a place to live, or other things that are real hardships, good for them to know, if they don’t already. If you succeeded in spite of those obstacles, it speaks well about you at a lot of colleges. If you’re filing Early, make sure you ask about your school’s deadlines for requesting transcripts. Request any dual enrollment transcripts early too, to avoid problems at the 11th hour. Do not drop Early Decision transcript requests at the last minute. It is discourteous, and it can mess up your application. Always thank the people helping you expedite paperwork, or filing on your behalf. You have done your homework. Write well, and execute the vision of where you want to be. Collaborate with guidance, professional help, teachers, and parents. No one is an island. It takes a lot of support from people skilled in this stuff to get you into school!